A few weeks ago, I took requests to play a game over Twitch on one of my few days off, and one of the games suggestion was FTL’s 1984 classic Sundog: Frozen Legacy. Since I’ve had numerous friends suggest to me that I should, nay, NEED to play this game, I finally took the hint the universe was giving me and fired it up. There’s a wrinkle here, however, in that the first installment was using the Atari ST version of the game, which was very glitchy and problematic. 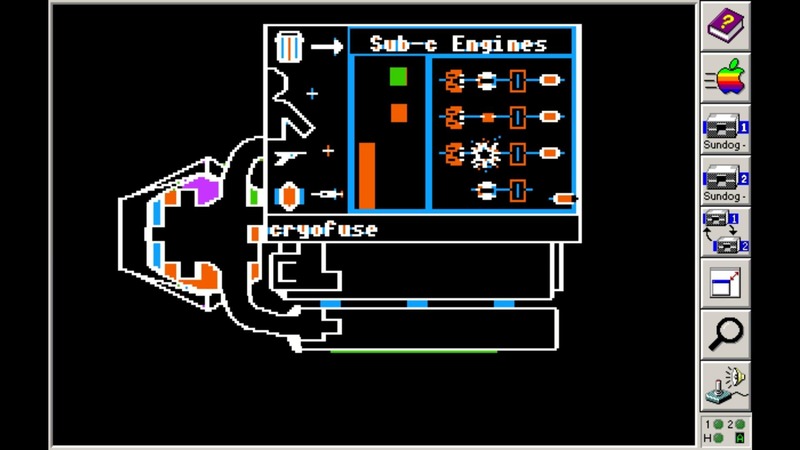 I therefore ditched that version for the original Apple II version which you see in the screenshot above. I’m keeping both videos for prosperity, but from now on I’ll be using the Apple version. I hope you enjoy my journey through this wacky game, and thank you for watching. That looks kind of cool. I was more on Commodore as a kid, so I missed most of the Apple side of the world back then. Me too, I was on the TRS-80 side of things so I missed ALL this stuff. Ooo, yeah, I had a friend who had one of those. The only thing I remember from it is “Polaris”, which IIRC was a Missile Command clone. I cut my teeth on a VIC-20 (8-bit 0.5MHz CPU, 3K of RAM, baby! ), but the C64 was where I played most of my games as a kid. There was a *lot* of really good stuff on the C64 (I assume on the other machines as well), and a lot of the ideas have since been forgotten. I used Vic 20s in middle school. Daaaayum. Souvenirs souvenirs, i do remember playing it on my apple IIc, great game ! Wow! It only took a year, but you’re playing Sundog! I’ll have to watch these tonight! Hi Brian. 006 means you’ve been playing for 6 days of game time. Glad you’re playing the Apple version. The Atari has a couple of bells and whistles that the Apple does not. For example you cannot park in the street or your vehicle gets locked up. Combat is a little harder on the Atari. The BEST way to play this was with an old analog joystick that could have centering turned off. When you get to space combat it was easy to match a target’s speed and blast ‘em. Much harder on a mouse. I haven’t found anything comparable. A flight stick is too big, obviously. Aren’t there game pads with little analog joysticks? Previous story Holy Crap! Tony Zurovec Joins the Star Citizen Team!